Third episode of the 'Kof' series, as many players begin now to name it in 1996, The King of Fighters 96' is the first installment of the series to overcome the legendary 330 megabytes limit, with no less than 362 units. 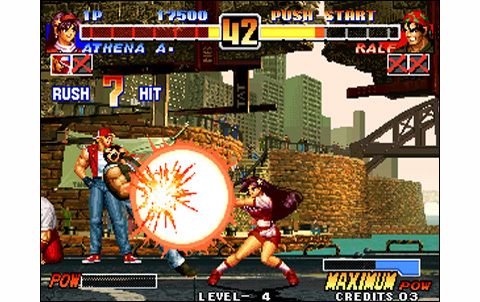 As the year is one of the richest ever concerning the Neo Geo greatest releases, and especially VS fighting games (Ninja Masters, Samurai Spirits IV, Waku Waku 7, Real Bout Special...) the serie is now considered as the flagship of SNK 2D fighting productions on consoles and arcade, and this is true since the very successful 95' episode. And this new edition to be simply the most revolutionary ever seen. Why? New basics take place this year. 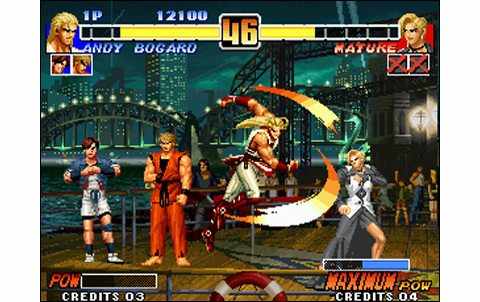 The characters are re-designed from A to Z: artworks and sprites have improved significantly, while new warriors - coming from FF and AOF series - make their appearance in the saga. 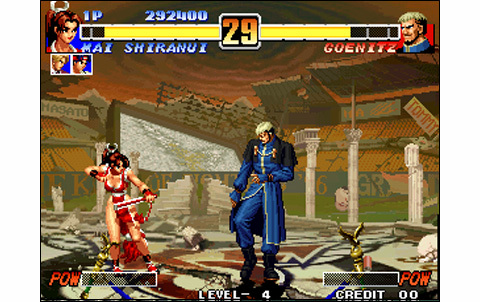 Among other things, Mature and Vice, Rugal's secretaries in 94, are emerging in the roster, as well as Kasumi (not Kastumi, wicked band), who is Todo's daughter, Leona taking the place of her father, Heidern, while bosses Geesse Howard, Krauser and Mr. Big make their (spectacular!) entrance. 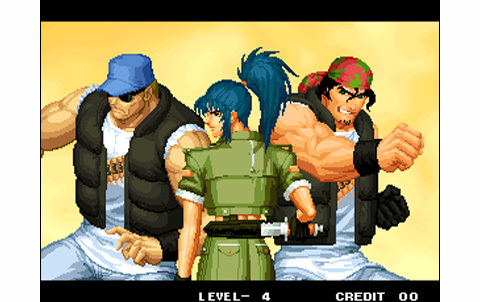 Only Chizuru and Goenitz, the big boss es of the album, are brand new characters not affiliated with any other nor any saga. 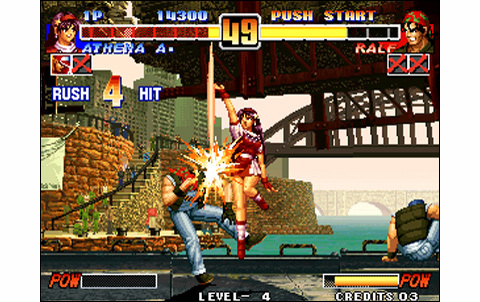 Graphically very successful, the game features a dozen stages particularly beautiful, and most of them are evolutive: Arizona, backdrop teams Art of Fighting and Fatal Fury, sees its weather change over the rounds; the Boss team on a barge in Venice battle over the waves... SNK does what it takes to renew the series' design, without betraying the style that suits it so well. The heroes are more beautiful and charismatic than ever, but moreover, their animations have changed considerably, and all of them now have much more elegance, smoothness and fluidity. Ok, about Chang, we could not do anything, sorry. 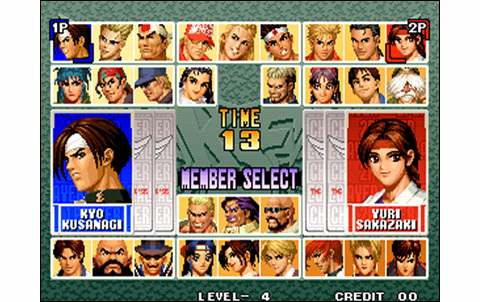 So it's quite a huge work on the sprites of the game, especially taking into account that this Kof has twenty-nine characters, three more than the previous episode; plus the changes, as Leona replacing Heidern, Mature and Vice to replace Billy and Eiji - bringing the total up to nine newcomers. 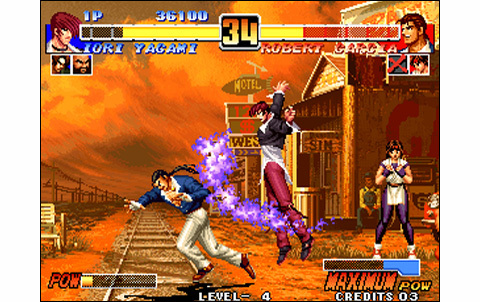 Animations are more decomposed than before and new moves have emerged or replaced other ones: A+B now performs a recovery roll forward or backward, as -> -> now allows to run. 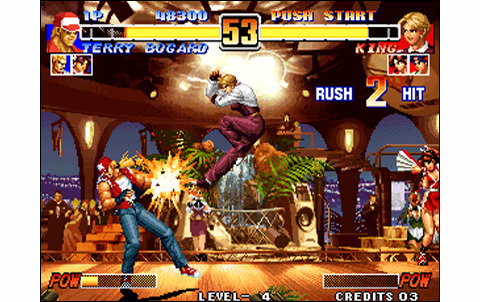 According to the pressure on the stick's directions, you can also vary short and long jumps. Manipulations to execute Desperation Moves have been simplified for a lot of characters, and this is not luxury, as some of those were pretty hard to do! Now there's a higher level of these: the Super Desperation Moves. 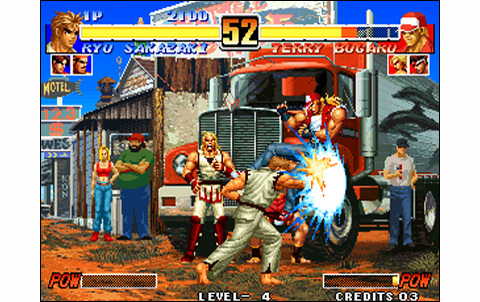 These are more powerful versions of DM, and can only be performed when your life bar is flashing AND the power gauge is full. 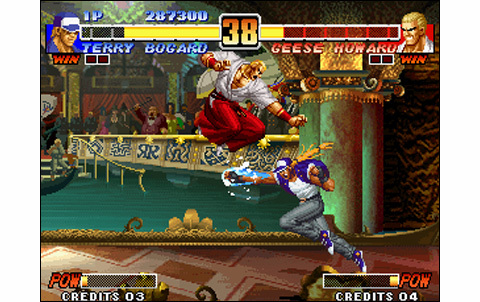 A host of small details are added and for example Kyo, Iori or Benimaru have some new moves and specials, like a lot of other warriors. With a romsize that went from 250 to 362, no need to say that graphics and animation are damn impressive for a 1996 game, especially with this pretty successful design. But the sound part has not been forgotten too! Digits of brand new voices with better quality, themes arranged and effects upgraded, all being way more varied than before. 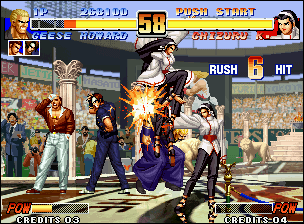 The King of Fighters 96 is the clear winner for the realization, compared to its two grandfathers. 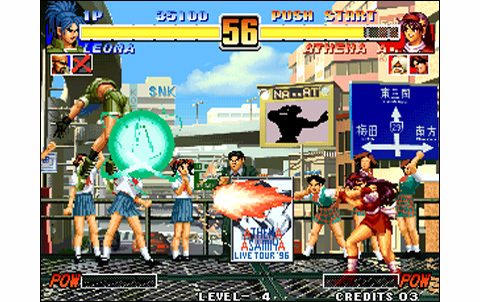 And as we saw in the previous chapter, the roster is even more plentiful and the gameplay 'modernized'. It's more precise and technical than ever, and given the size of the roster, there are some imbalances between characters that only real experts can deplore. 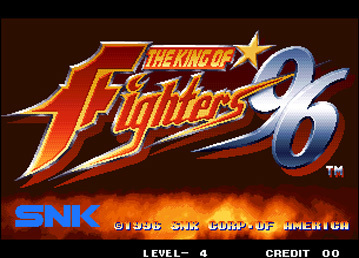 This excellent Kof 960 'marks an important milestone in SNK's flagship series. 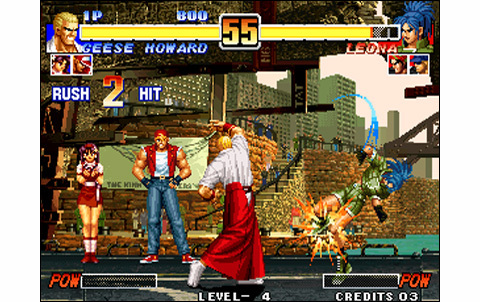 Contrasting sharply with the 94 and 95 games, this sequel redefines new solid bases pour future episodes, featuring smooth gameplay with new mechanics, and graphics making it one of the finest Kof installment ever made. 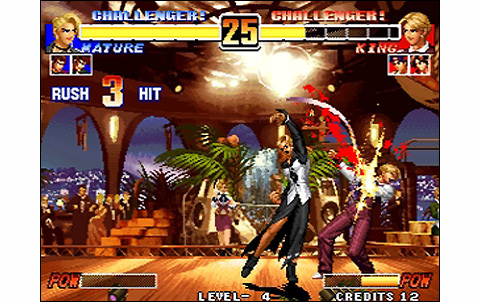 We're facing one of the most gorgeous Kof ever made, no matter the year it was released: Kof 96' is offering splendid evolutive stages and a successful character design. 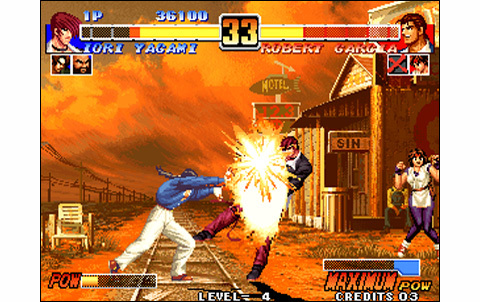 Game gained a lot of smoothness with new animation steps and redesigned moves, and also some increased speed. Sound is now more punchy than in previous episodes, and a lot of new effects and vocals have been added. 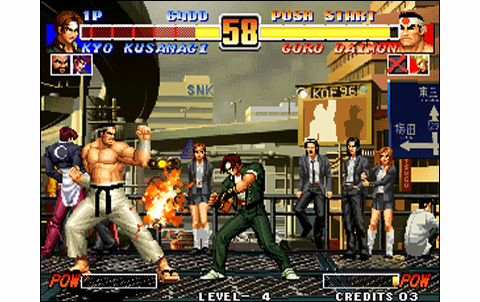 A new record is set with 29 characters, full of combos and special moves, plus 5 Bosses to beat in order to see the end! 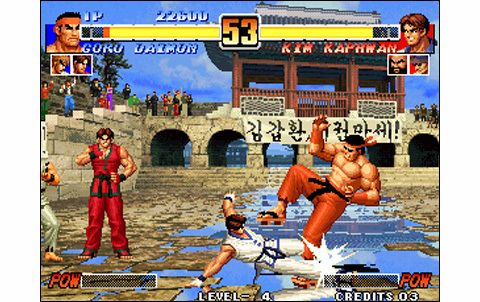 Gameplay gains a lot of flexibility since Kof 95', combos are more numerous than ever and game mechanics have improved again: smart! 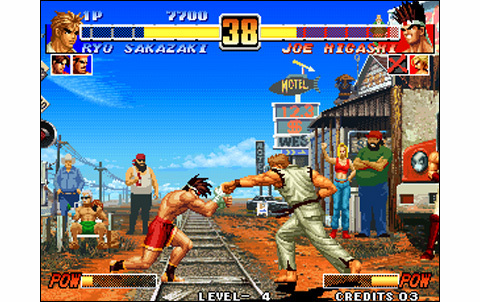 New design for fighters, new sublime stages and musics, huge roster and improved gameplay... it's great art! 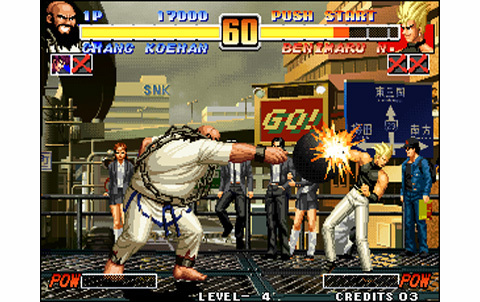 As usual with the games of the KOF saga on the Neo Geo AES, you'll get what you paid for. 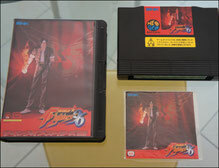 Of course, as long as you opt for the japanese version! This 96' millesim will cost you a modest amount of sixty euros, so you'd better go for it, it's a deal!